Having being out of the race seat for while both Chris and Mika were eager to get back behind the wheel of their GT4 Aston Martin. Work commitments for both meant that Fridays test was not possible so it was decided to race in the ‘Road Sports’ race on the Saturday so the duo could get familiar with the Silverstone International Circuit layout. Qualifying went ok securing P13 out of the 44 competing cars. The race was 45 minutes long with a driver change between the 15 and 30th minute. The standing start was farcical, as the usual countdown procedure was changed and as the lights went out for the start of the race some cars hadn’t even started their engines, ours was one of them. 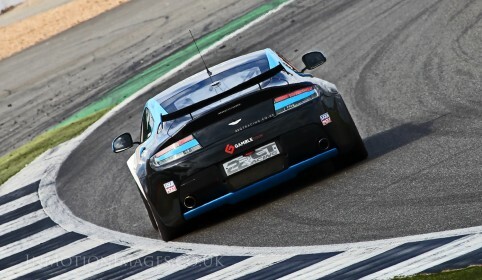 Once Chris had got the Aston started and a gear engaged he was already 30 seconds behind the race leader and in dead last position. Putting this set-back behind him he quickly started moving up the order and pitted in P24 after 22 minutes. Mika took over and clawed his way up to P16 when the chequered flag fell. Qualifying went better than the previous day and although the duo was over a second faster they only managed to qualify 15th out of the 42 cars on track. Chris started this rolling start, 2 hour race and managed to move up the order on the opening lap to P13. After getting into a rhythm his 42 lap stint saw him in P11 by the time he bought it into the pits to hand over to son Mika. During the pit stop the team taped the front of the Aston as Chris had contact with a BMW and the front bumper was unsecure. Mika exited the pits in P10 and once all the pit stops had taken place by lap 55 we were in a strong 6th position. The next 14 laps Mika upped the pace to catch and overtake the 5th place Porsche, recording our fastest lap of the weekend 1.16.4. The P4 Lotus was also no match for the charging Aston and that spot was taken 6 laps later. Some great racing from both Chris and Mika was rewarded 5 laps from the end when the P3 BMW pulled into the pits and retired. The radio instructions relayed to Mika was to just finish the race as the lead cars were too far away to catch. Once he crossed the line he was told that he’d actually finished in P3. It was a great result and a top all round team effort. Chris and Mika will be next out in the final round of the Cartek Club Enduro at circuit de spa-francorchamps on 1st October. More information on this event will appear soon. Check back closer to the event date for an update. Thank you for your interest in 22GT Racing.